My issues with seafood are more than an aversion; they’re a reaction. It’s the type of nonsensical thing better explained in a Psychology 101 textbook than a food blog, but it basically unravels like this: I see a spectacular presentation of seafood on a menu or my husband’s plate and I yearn for it, but when a single fork-speared bite gets within an inch of my mouth, I go into bloodhound mode, finding some otherwise undetectable unpalatable “fishiness” and I abruptly panic. It’s such a strong, specific and illogical reaction – to not take a bite of something that appeals to you – I’ve said to my husband (an avid eater of smoked, boiled, broiled, breaded, fried, poached, shelled and de-shelled seafood of every color and shape) on more than one occasion that I wish I could just go to a hypnotist to help me “snap out of it.” He thinks I am kidding; I am not. Never doubt a woman quoting Moonstruck. But, enough about my failures! Let’s talk about my one, single seafood success story: mussels. As a gateway fish (as opposed to the more-predictable tuna or shrimp) mussels really make no more sense than my rejection of such an evident delight as butter-drenched lobster tail (even typing this, I am further assured of my madness), but it’s where I am at right now and I do say, this recent batch were among the tastiest we have ever cooked. We had a 100% success rate with them – not a single came home DOA or refused to open – and they were unbelievably sweet and respondent to Julia Child’s marinière broth. Because what are moules without frites, I paired them with baked pommes frites that were as close to the real thing I’ve ever tasted, (I think the secret’s in the twice-cooking done in the deep-fried version.) crusty bread and a sancerre, and it was one of the most delicious meals we eaten at home in weeks. Better yet, with every wine, shallot and butter-drenched bite, my angst over my non-conversion to seafood grew quieter in my mind, whispering promises that one day, maybe even soon, we can move on to pan-seared scallops. 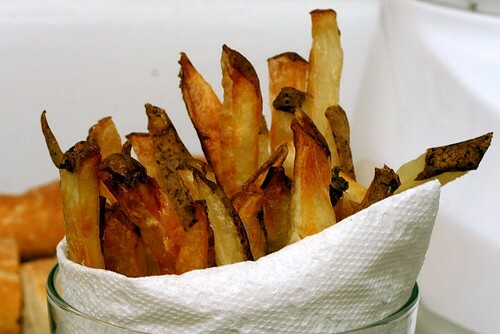 Preheat the oven to 400 degrees F. Peel potatoes (if peeled fries are your thing, skip it if you couldn’t care) and cut into half-inch thick slices (lengthwise) cut again into 1/2-inch thick fries. Place the potatoes into a pot with cold water and 1 tablespoon of salt. Bring up to a gentle boil and simmer until a paring knife tip goes through easily, cooked about 3/4 of the way through. Drain carefully and put potatoes a bowl. Add olive oil, 1 tablespoon salt, 1/2 teaspoon black pepper. Toss well and lay out in 1 layer on baking sheet. Bake until light brown. Oh my goodness. As my sister would say, Yummers. I’ve never met a piece of seafood I couldn’t get along with, whereas my husband is getting accustomed to bites like these, and I’m glad to say that mussels were a baby step along this progression. Good luck with the rest of the aquatic food world! Tyler Florence did a food 911 on that very menu this past week. IT was for a group of gf’s that all went to Paris together and wanted to re-create that meal.. I love to eat seafood, but with the exception of fish on the grill, I hate to cook it. The smell! In the house! Ye Gods. Your pics, however, are enough to encourage me otherwise. Beautiful! I have the same fishyness aversion. Here’s hoping to my eventual transformation, as well. And I am MAKING those frites one day. Oh, boy, I think that if you can do mussels, you can do scallops. I love the little guys, but when I have a choice I will pick clams. There’s just a lot less going on in there. Less anatomy. Wow! I am a mussel addict and your pictures are making me drool. Looks soo good! I’m going to get up my nerve and give making my own mussels a try. Omigosh, your photos are mouthwatering. Yummy! It all looks wonderful, except,… where’s the garlic in all of this? Must be good if I dip my bread into the sauce also! I’m loving your website and am now on a mission to make (nearly) everything you’ve made (despite hardly making a sandwich before now). I actually have lemon-yogurt-anything cake baking right now! Anyway, I fell in love with mussels last summer on a trip to Sonoma and have been longing to make them ever since. One question: what does it mean to, with a big skimmer, dip the mussels into “wide soup places”? I have that exact same issue with seafood. I think I must have got very sick after eating some as a little kid and no one picked up on it. Congrats on getting this far. It’s more than I’ve done, which is limited to eating fried shrimp with cocktail sauce. Made these fries tonight along with garlic shrimp (no mussels today at our local super market!) Great hit! Don’t forget to add some saffron to the broth! Anna- I just checked with my copy of Julia Child’s Mastering The Art of French Cooking and the recipe wording is “large soup plates.” Funny how a typo can make an otherwise simple direction so confusing. Incidentally, I have not once cooked from this book (though I know that I should…), but use Smitten Kitchen all the time. Love the site, the photos, and your narrative Deb! I tried this last night…..it was OK. The one thing that totally got me was 6 quarts of mussels…..even google doesnt know the answer to how many pounds that is HAHAHAHA I used 2lbs. I tried this last night – the mussels were totally awesome, but the fries were not! How long do I boil the potatoes? As soon as my “paring knife tip [went] through easily”, it seemed like they were far too soft (almost mash-ready). I put them on an oiled cookie sheet and seasoned and baked as directed, but after 25 minutes in the oven, they were still soft and steamy. Help! How do I get them looking lovely and browned like in your photos? I don’t own an enameled kettle – would a large pot work? Yes, of course. I will update that in the recipe. Clive- I had the same question. Can someone please tell me how many pounds of mussels to get for this recipe? I also can’t find a conversion for quarts to pounds. Thanks in advance. I landed on this post when I searched your blog for “fish”, trying to see whether I was right in thinking that there was very little fish in this here blog – which, I think, is one of the (many!) reasons that I like you. I’m not much of a fish eater – but mussels are on my list, and people look at me cross-eyed when I tell them I’ll eat mussels but not lobster, salmon or halibut. I’ve recently branched out to raw oysters. Another big hit! This is a very simple but elegant meal. So easy to throw together for company as an appetizer or a full meal with heartier sides. I made the baked fries too, and found I let them boil a little too long, so it was difficult to keep their shape. Next time I will boil less and more carefully drain before baking. Still turned out delicious! I just made this on Friday for my birthday! It’s too bad that I didn’t discover your lovely site until yesterday (thanks to tons of free time caused by the big snowocalpse) because I would have loved those pommes frites, too. These were terrific! Thank you! Alexis – I’m not sure on the correct conversion between pounds and quarts; but based on estimates I think maybe around 4 lbs is six quarts? I halved this recipe and made 2lbs of mussels with one half of the ingredients and it worked out really well. Good luck to all who are attempting, this is truly a treat! I think that you can easily convert the ounces into pounds. Q: what do you mean by ‘soaked’ mussels? I haven’t run across that before. Tip: one of my cooking instructors told me that as you’re cleaning mussels, you may have some that are open, which can be ok. Take an open mussel and a closed one, and tap them gently together under running cold water. Apparently they think the tide is changing, and they will close if they’re still alive (and therefore good to eat!). Works for me, hope it works for everyone else! omg, Deb + Julia Child = genius!! this recipe blew my usual mussels recipe out of the water, it was beautiful. as always, thanks so much for making sure that i keep myself, and the people around me, well fed! I adore mussels and eat them any chance I get, which is fairly often as I live on the west coast, but I am in agreement with you on lobster, not my favorite ….. but I love crab esp. Dungeness. I love oysters but can’t stand clams. Love Salmon and Tuna but only if its fresh and Halibut puts me near ecstasy if cooked properly. This recipe looks great and as soon as mussels are available these babies are hitting my dining room table. and I also meant to say that I love the presentatin of the frites. I am always looking for unique ways to dress up a table and that is really great. Hi. I have the exact same reaction to seafood. I’ve always had it. Im the only one in my family that does’t like seafood. A boyfriend once suggested I get hypnotized. Got here by hitting the “Surprise Me” button, and HOLY CRAP, you read my mind. I have a serious aversion to all things seafood with the exception of the most beautiful moules (and, of course, their accompanying frites) at a local Belgian place. I went there once, didn’t get them because of aforementioned aversion, regretted it deeply after inhaling the sweet fragrance coming from my dining partner’s plate, and went back THE NEXT NIGHT and devoured the entire bowl like a mussel-crazed madwoman. Je ne regrette rien! Oh, this just warms my little Belgian heart! Definitely spot on about cooking the frites twice–that’s the real secret–and all you are missing is some mayonnaise! Side note: groceries in Belgium actually sell pre-packaged bags of greens (pretty much exactly the ones you listed) specifically for making moules. My head is screaming at me right now lol. Thank you for this recipe. My wife is a huge fan (talks about your site all the time, makes so many of your recipes, and couldn’t wait until your book was released), and I made this for her birthday tonight. I’m more adventurous than I am good in the kitchen, and I wanted to surprise her with something from this site. Every bit of it was delicious… so delicious. Now I know what I’m making my wife for her birthday dinner on Friday. Lovely! Wow. This sounds great! How many does it serve? Also…how long approximately would it take to turn the potatoes light brown? I love all kinds of seafood– well, almost all: no catfish, no calamari… It’s meat that I tend to get weird about: venison ( two bite limit); the very idea of eating a cow’s tongue; kidney ( tho I’ll eat a little bit of liver if it’s tender and cooked exactly right)…even looking at chicken in a supermarket or imagining pink slime lurking in ground sirloin under that pristine shrink wrap can send me rushing back to the safety and security of the produce aisle. When PEI or Tenants Harbor mussels are available,love having them lots if different ways and another great favorite is in a spicy puttanesca type sauce. 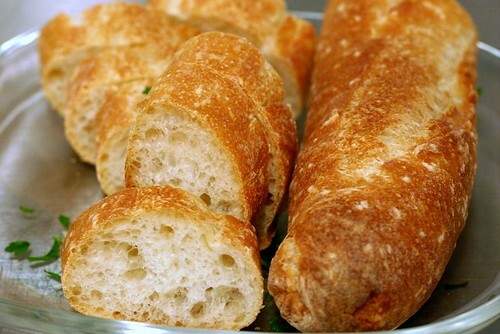 I’d love a fabulous crusty baguette recipe to accompany that or any of these. This looks fantastic! I’m recuperating from ankle surgery at the moment but as soon as I can drive again, I will make these mussels. To the person who said if you like mussels you’ll like scallops….. No, no, no! I looove clams, lobster, mussels, most all fish & shellfish. I do NOT like scallops! Something about the texture in my mouth. Every now & then I will try one or two. It is getting better, but not my choice of shellfish. Huh, scallops are about the only shellfish I eat, but I’m similar to Deb in not being too adventurous with shellfish. My husband and I just hosted a moules frites party last night. It was a raving success and I wanted to give some feedback. We found that we used 1/2 lb of mussels per person. We got them that morning from our local Costco and were very impressed with the quality; they were well cleaned with very few beards and no sand. I tried both the Michael Chiarello original recipe and the Smitten Kitchen recipe for the fries and we all preferred Deb’s. I made 8 large potatoes and it took about 45 mins to bring them to a boil on my stove then I put them in the oven for about 35-40 mins. I got the best results when spreading them out on the pan and not letting them crowd. I hope this helps and I would highly recommend these recipes for a large party. My mussels always turn out gritty. Any tips on soaking and scrubbing? Any thoughts on adding a bit of sugar to the frites to get them to crisp up in the oven? in the last paragraph it says “dip the mussels in wide soup places”. What does that mean? Randigb — It should say plates. Now fixed, thanks. Mari — Have never found it necessary, especially with Russets which are naturally a little floury and can crisp up well. jamie — Julia Child has very details instructions in MTAOFC, but these here are about what I do, and should work too. Sara — I haven’t, but I’ve made sweet potato fry-ish wedges other ways. I agree that it’s very hard to get a crisp on them. The wedge shape helps. I don’t think that the twice-cooking we use here for more floury/dry potatoes is necessary for sweet potatoes, though. Thanks for the quick response, Deb! Appreciate your input. Any guidance as to how long it takes to bake the potatoes to “light brown”? 5 minutes? 50 minutes? Hi Deb – Do you have guidelines on how to long to boil and how to long bake potatoes? Thanks! Katie — It’s never an exact science and has a lot to do with how you cut the potatoes. The parboiling is usually 3 to 8 minutes, the roasting 30 to 45 but it’s best to keep a watch on them. I bought the book and decided to try these recipes for a big group of people (7-8) last night with my Belgian partner (who was super skeptical). The advice in the book about cleaning the mussels was excellent — I’d never cooked with them before so it really helped. The only part where we failed was with the fries. We wanted to prep as much as possible in advance so cut the potatoes the night before and kept them soaked in water in the fridge. Perhaps because of this they never reached the crispness that we were looking for. How many people do each of these recipes serve? How am I JUST finding this recipe?? Can’t wait to try it. Can you tell me how many servings it makes? First, a comment: I am deeply appreciative of your blog because it’s allowed me to reconnect with the half-Jewish side of me (by making your chicken stock and matzo ball soup several times already), and knowing that anything I make will turn out delightful (unlike the..ahem..majority of rando Pinterest recipes). Next, the question with background: My absolute favorite mussels broth I’ve encountered is at a restaurant in SF called Plouf; they have what is called the Poulette, which comes with shallots, bacon, white wine, garlic, cream, and parsley. I’m assuming that I cook the bacon first, then the shallots and garlic in the pan with the drippings, add white wine and boil to allow the alcohol to burn off, then the cream and parsley to warm up in the pan for a minute or two? Or should the milk, bacon bits, and parsley be added after the mussels are boiled quickly in the white wine broth? Follow-up question: Any other herbs/spices to add? Thyme, pepper? Thank you. I’d crisp up chopped bacon, scoop out the bacon, drain it on towels, set it aside. Then I’d add the shallots, garlic, wine, a small splash of cream (I bet a little goes a long way here) and cook as instructed here. Serve with the parsley and the reserved bacon on top. A VERY BEAUTIFUL PEACE OF ART THE MAROON MAZDA RX 8… I can only afford to purchase it 10months from now but surely once I have my money ready i will defnately know were to come find my dream car… Thankyou B4ward. Just made this tonight for a solo dinner while my husband had a work event. It turned out very good! I used instructions from the latest smitten kitchen cookbook to clean the mussels first. The mussels were all cooked well, though most of them fell out of the shells. I wish the sauce was a little thicker, but a sucessful first try at mussels! Sorry if this is a repeat. I tried reading through all of the comments. How many servings is this? I’m looking scale down for two people. Thanks! !